Diving into Yoggogawa. All photos courtesy of Wandercooks. Laura and Sarah, the dynamic duo behind the food and travel blog Wandercooks, have been traveling throughout Asia for the last eight months. 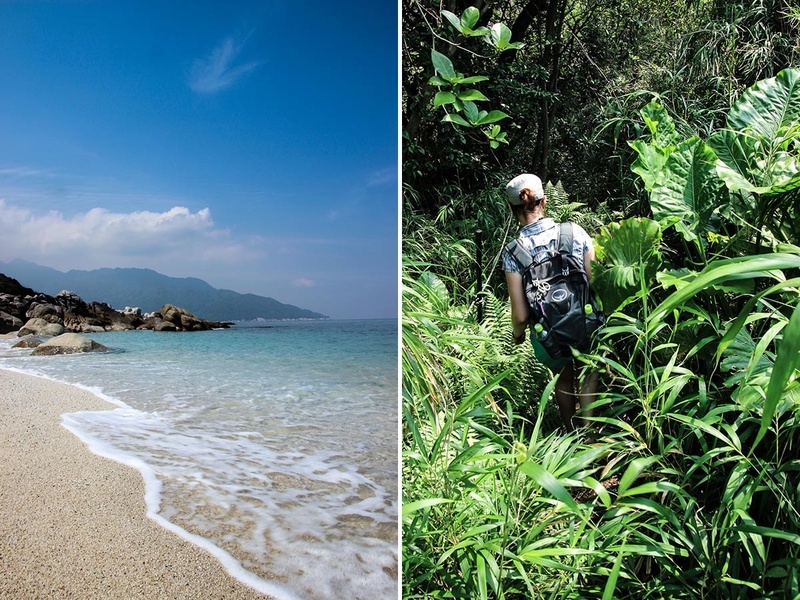 Among bustling cities and majestic hinterlands, they spent four standout days on the heritage-protected tropical island of Yakushima, Japan. Here's what made the trip so special. YAKUSHIMA, Japan – Yakushima, a gorgeous tropical island off the southern coast of Kyushu, is a paradise for nature lovers. Hiking, swimming, and adventure abound, yet it remains off the international tourist radar. After weeks of living the city life in Osaka, my travel partner Sarah and I needed a healthy dose of exercise and fresh mountain air to recharge our batteries, so we planned a packed itinerary with Yakushima Experience, an excellent guide service offering private and group English tours, to see as much of the island as possible. 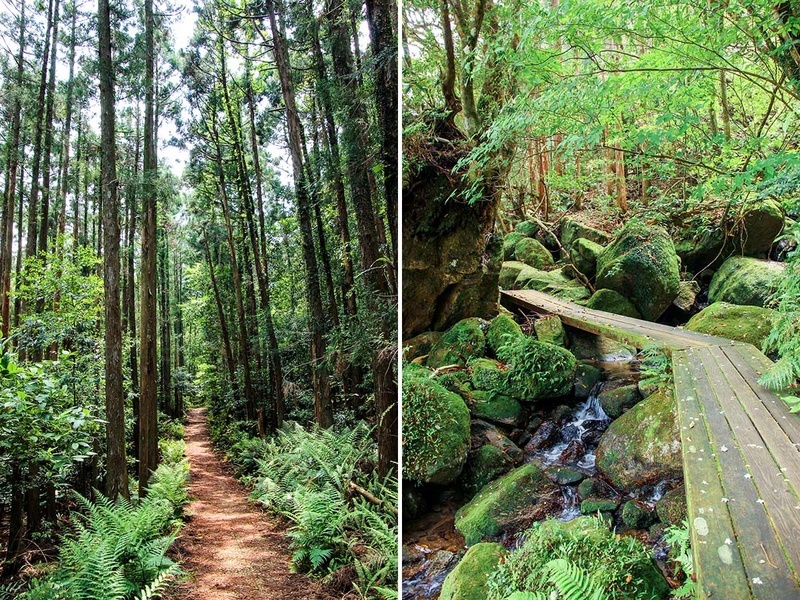 Shiratani Unsuikyo, a mysterious natural park nestled in the mountains above the town of Miyanoura, is one of the most popular hiking destinations on the island. And it was easy to see why. Walking through its moss-covered forests was like stepping into another world. Gnarled trees competed to reach sunlight, almost parasitic in the way they entwined around each other. Most majestic of all were the immense ancient cedars, or yakusugi. We were honored to stand in their presence knowing that many were thousands of years old. We followed the forest trail, which was clearly marked with signs and maps, to the ravine to admire the river below, stepping onto the suspension bridge and taking cautious peaks over the edge. We were shocked at how blue and clear the water was. It didn't seem real. 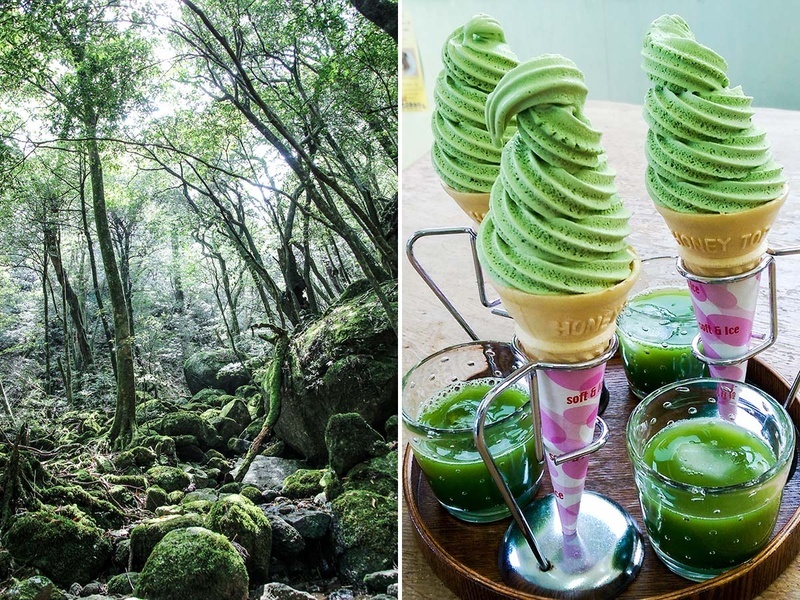 After the hike, we were spoiled rotten at Hachimanjyu Chaen Tea House (532-24 Koseda; +81-997-43-5330) with bright green matcha ice cream and organic green tea prepared by a pair of local women using home-grown leaves. You could say they were a match-a made in heaven. 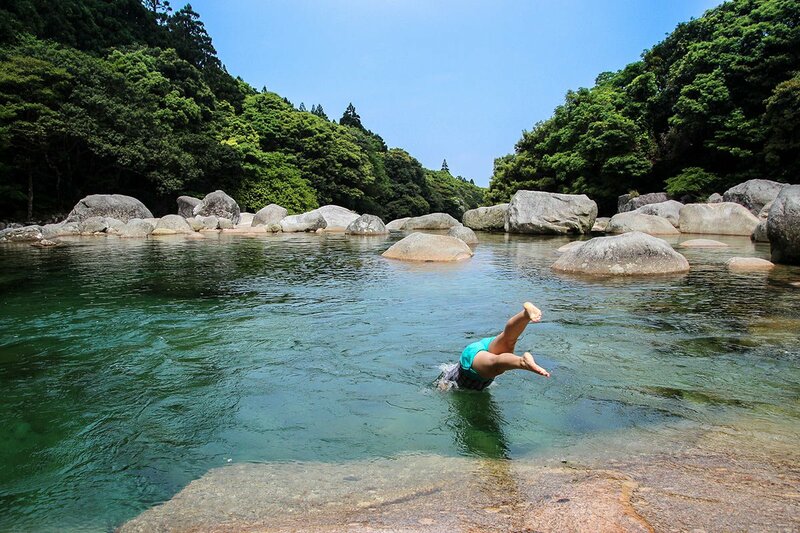 Yakushima is known locally as the Hawaii of Japan for soft and sandy stretches with crystal-clear waters and rocky foreshores teeming with marine life. Some beaches even have signposts and carparks and toilet and shower facilities. Cameron, our guide from Yakushima Experience, had something special in store. We were whisked away to the beach for an early morning swim, pulling over on a random stretch of road and bush-bashing down an overgrown path that was impossible to spot from the car. On the other side, gorgeous white sand, palm trees, and off-shore island views punctuated our own little private paradise. From the hot white sand we waded deep into crystal waters to snorkel, chase fish, collect shells, and gaze at neighboring islands. We had the beach to ourselves apart from one Japanese fisherman perched atop a massive boulder jutting out to sea. Unsurprisingly, the location of the beach is a closely guarded secret that we've sworn to keep. It's not on the tourist trail and there are no street signs for guidance, but if you book a tour with Yakushima Experience and ask nicely, Cameron will take you there, too. To rinse off the salt, we went to Yoggogawa, a natural freshwater pool a short walk along another deep-green forest trail. It's a popular swimming and picnic spot, but while we were there, we had the place to ourselves. We ran, dove, and came up breathless and gasping for air. It was achingly cold water, and in seconds we were scrambling gracelessly to get out. The afternoon continued with a winding cliffside drive and photo opportunities around every bend. 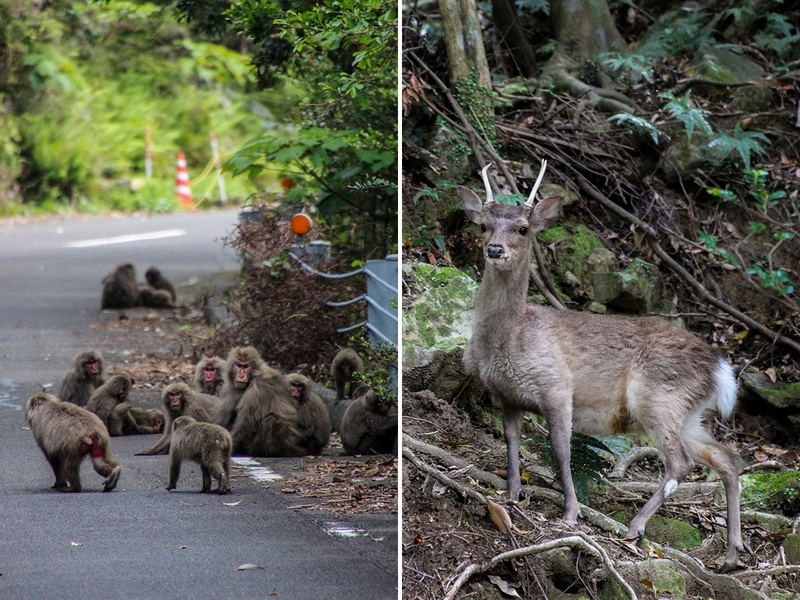 Beneath the forest canopy of the UNESCO Protected Yakushima World Heritage Zone, families of deer and monkeys were going about their daily rituals, completely unaffected as we passed them by. Fun fact: Yakushima was the first place in Japan to be designated a protected UNESCO World Heritage Site, in 1980. And while 20 percent of the island is protected by UNESCO, 95.5 percent is further protected by the forestry department. Preserving natural beauty is top priority around here. We followed the road to Nagata Lighthouse (891-4201 Nagata; +81-9974-5-2210), a remote tower perched atop a huge cliff overlooking the ocean. There's a concrete wall protecting the lighthouse and all who wander nearby from the steep, vertigo-inducing drop on the other side. We peeked over the edge anyway and found a tiny shrine dedicated to Ebisu (the Japanese God of Fishermen and Good Luck) just behind the wall, decorated with offerings left by other intrepid wanderers. After, we jumped into the car for a tour of Yakushima's incredible waterfalls. Our favorite was the 88-meter Ohko Waterfall. Its raw power was impressive enough from the safety of the public viewing platform, but even better from the rocky boulders strewn across the river at its base. We parked the car, threw on our packs, and prepared to climb Mount Tachudake, which, at just under 1500 meters, was the highest peak we had ever tackled. During our visit, Tachudake was wreathed in playful swirling clouds, covering and revealing the peak. We glared at the pesky palls and prayed they'd burn away by the time we reached the summit. As we set out into the chilly morning mist, we were enveloped by the peaceful serenity of the forest, its silence broken only by sounds of trickling rain, bird calls, and our treading feet. The trail wound deep into the forest, crossing picturesque rivers that were bitterly cold, no matter how inviting they looked. Steadily, we climbed steep and rugged steps that were either carved into the mountain or built from fallen trees. For the good of others, I demonstrated where the trips and traps in the path were as we made our way. We were almost crawling by the end of the trail, grabbing trees, rocks, and ropes left by helpful hikers until we reached the summit. And what we saw were clouds: That coveted view remained shrouded in a solid wall of blinding white fog. Rather than disappointment, we felt charged by the feeling that soaked our skin as we stood on the peak. Soon our thoughts turned to food (as they always do during a hike). Cameron gave us each bamboo-wrapped bento boxes filled traditional Yakushima foods — crumbed chicken, fish and prawn, egg roll, onigiri rice ball, and crunchy burdock root salad. 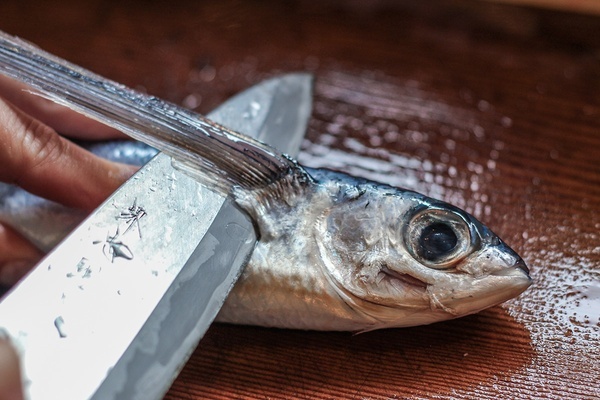 In the kitchen, Satono began filleting Yakushima flying fish, known locally as Toppy. I was jealous of her knife skills — my poor haphazard fillets left much to be desired next to her sashimi-grade perfection. But it didn't matter, since they were all blended, minced, and transformed into flying fish cakes. There are a lot of bones in Toppy fillets, so locals mince to solve the problem. The resulting fish cakes are deliciously crispy on the outside and soft on the inside, and are a speciality on Yakushima. Next we prepared organic venison pate with liver sourced from local wild deer. 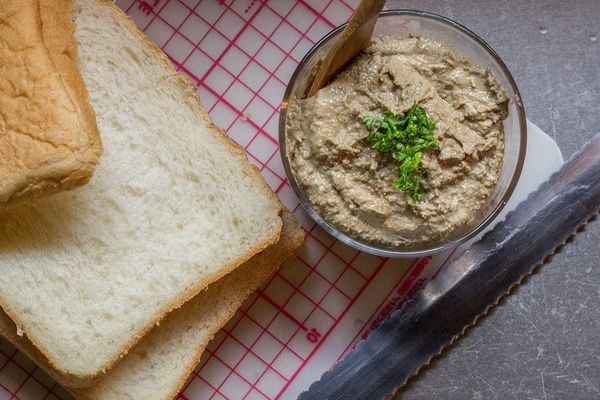 Cooked and blended with carrots, mushrooms, garden herbs, and a splash of red wine, the result was an unbelievably good moreish pâté. We complemented our meats with slices of yellow zucchini, fresh tomatoes, and crisp lettuce from the garden, and finished off with freshly baked Japanese bread, assembling the ingredients into the strangest open burger we've ever had. All too soon it was time to head back to the city. Four days and we'd only barely scraped the surface of what Yakushima has to offer. 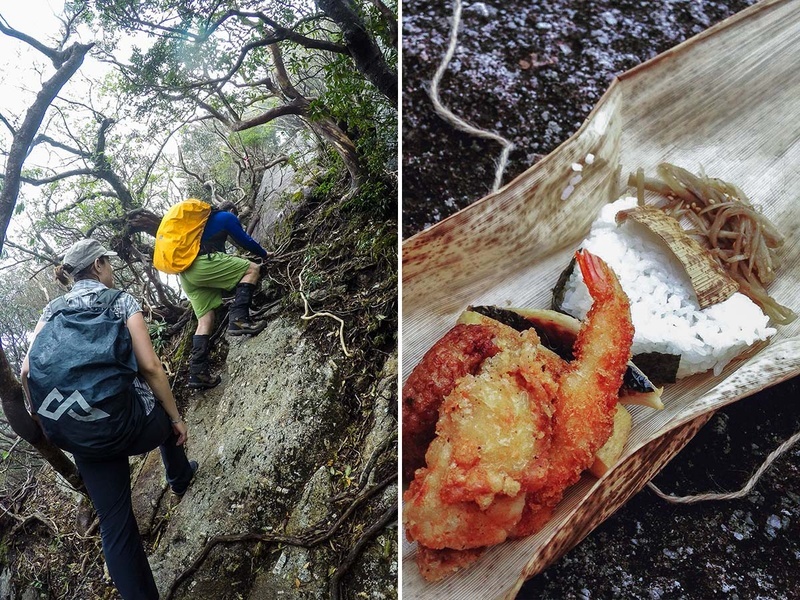 Wild adventures and incredible food experiences await those who journey to Japan's Hawaiian island paradise. The island is accessible by (fun!) hydrofoil or (slow!) car ferry from Kagoshima. Japan Air Commuter also flies to the island from Fukuoka and Osaka. Use this handy guide to transport options while planning your trip. Most places on Yakushima are accessible by local bus. Alternatively, there are many rental car options if you prefer convenience, but they can be quite expensive. We recommend booking with Yakushima Experience. (If you'd like to request our guide Cameron, email him here.) Tell them where you want to go and they'll build a tour just for you, or leave it up to them and they will take you to all their favorite places. There are accommodations for all budgets, from high-end luxury hotels to shared rooms. We chose to make our accommodation a part of our adventure and booked Daichan House (click here for reservations) just outside of the little town of Anbo Harbour. They have gorgeous, cozy Mongolian yurts with all the mod-cons — heating, air-conditioning, free coffee and tea, and WiFi. The super friendly, helpful owners don't speak much English so some Japanese will be useful, although not essential. St. Pote Bar and Restaurant (2364-17 Anbo; +81-0997-46-2905) serves Japanese and international dishes incorporating fresh, locally sourced ingredients served in a modern glass-fronted dining room overlooking the Anbo River. If you've been in the country for long and desire familiar flavors, Il Mare has amazing pizza and pasta to satisfy those cheese cravings. For hiking snacks, Yaohachi Bento (195-2 Miyanoura; +81-0997-42-0414) on Miyanoura High Street sells bento boxes from 500 yen ($4 USD). Pre-order them the day before and arrange a suitable time for pick-up. Stores on Yakushima are plentiful but basic. The closest one to the ferry port is Life Center Yakuden, which has food, clothes, and electronics. There are also A-Coop grocery stores in Onoaida and Miyanoura, and a locally branded discount shopping center in Anbo. Laura and Sarah are the duo behind the food and travel website Wandercooks. You can follow them on Facebook and Instagram at @wandercooks. They travel for the thrill of discovering new places, faces, and flavors.